​We've all been there. You paint your nails and have that annoying moment of fanning your hands about and furiously blowing on the tips in an attempt to get them to dry quicker. It's common knowledge that it doesn't do much (except leave your fingers covered in spit) and all you can do is sit and wait patiently for the nail polish to set. But is that really the case? We recently stumbled across a tip that holding your hands in cold water can make the polish dry a lot quicker. 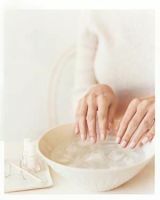 Filled with excitement and hope, we turned to celebrity manicurist Michelle Humphrey for some answers – because who else would be better informed than the woman whose talent graces the talons of Madonna and Katy Perry?